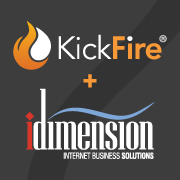 Joining forces, KickFire and iDimension will showcase how to connect account-level identification to your Google Analytics 360 Suite on Thursday, December 7, 2017.
iDimension has extensive knowledge of the Google Analytics platform and mastered all the ins-and-outs of Google Tag Manager. These skills, combined with KickFire’s IP address intelligence, bring a whole new level of insight and sophistication to the Google Analytics platform. KickFire®, the leader in IP address intelligence and company identification technology, announced today that it will partner with Google Analytics® Certified Partner, iDimension, to host a live webinar titled, “How to Teach Your Google Analytics New Tricks," on Thursday, December 7, 2017 at 10:00am PST/1:00pm EST. This informative webinar, hosted by KickFire’s Tina Bean and Maggie Taylor Aherne and iDimension’s John Babb, will discuss how to enhance Google Analytics with B2B company firmographics and business intelligence to deploy, segment, enrich and retarget audiences. iDimension, a Google Analytics Certified Partner since 2010, built an easy-to-deploy Google Tag Manager container that enables their clients utilizing Google Analytics, Google Tag Manager, Google Optimize and Google Data Studio to deploy KickFire’s data across the entire Google Analytics suite. “During our evaluation, we were pleased to discover KickFire is a cost-effective source of highly accurate data that allows our clients the flexibility of being able to process account-based intelligence data client-side via Google Tag Manager without needing server-side access,” said John Babb, Founder of iDimension. To learn more about KickFire, visit KickFire.com, call 408-493-0456 or email sales(at)kickfire.com. For more information about iDimension, visit iDimension.com. iDimension was incorporated by John Babb in 1998, and serves customers worldwide from its Tampa Bay headquarters, as well as offices in Atlanta & Durham. We are focused on helping clients formally define success for their digital properties, deploy technology to accurately measure success, and then initiate an optimization cycle. Defining & measuring success are the foundation on top of which we help our clients improve. A Google Analytics Certified Partner since 2010, iDimension is 1 of only 21 partners in the US authorized to both service & sell Google Analytics 360 Suite products, and 1 of only 11 in this group that has achieved simultaneous Google product certifications for “Google Analytics,” “Google Tag Manager,” “Google Optimize“ & “Google Data Studio.” For more information, please visit iDimension.com. KickFire is the leader in cloud-based B2B sales automation and IP address intelligence. The KickFire solutions are powered by TWIN Caching, an advanced, proprietary IP-to-company identification technology. TWIN Caching systematically caches and analyzes over four billion IP addresses, going beyond traditional IP association to uncover last-mile connectivity ownership. KickFire’s complete suite of solutions enables companies to tap into their website’s invisible pipeline and transform anonymous visitors into actionable sales opportunities. VisiStat, Inc., doing business as KickFire, is a privately held company founded in 2005 and based in San Jose, CA.